The terms Rock of Gibraltar and the peninsula where the settlement of Gibraltar is located are synonymous with each other. This peninsula, located on the southern coast of Spain, and its famous 1,400 ft. limestone mountain have evolved from a place of religious reverence in ancient times into one of the most densely fortified and fiercely contested locations in all of Europe. Neolithic remains, dating back 25,000 - 50,000 years, have been found there. 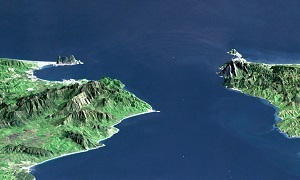 The Phoenicians established an early settlement near the Rock of Gibraltar, at Carteia (San Roque), in about 950 B.C. The town was conquered by the Carthaginians in 228 B.C. and by the Romans in 206 B.C. 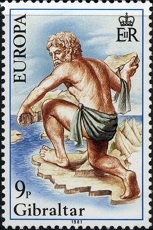 Hercules Astride the Strait of Gibraltar, Placing his Pillars. The Rock of Gibraltar was one of the mythological Pillars of Hercules. 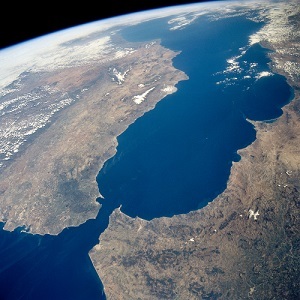 It was known to the Romans as Mons Calpe, with the other pillar being the smaller Mons Abyla or Jebel Musa on the Moroccan side of the Strait of Gibraltar. In ancient times these two points marked the Western limit of the known world. According to Plato (428 B.C. - 348 B.C. ), the ancient Greek philosopher, the lost continent of Atlantis was situated beyond the Pillars of Hercules, placing it in the Realm of the Unknown, in what was called in ancient times, The Sea of Darkness. During the Renaissance, it was said that the Pillars of Hercules bore the warning "Non plus ultra", meaning "nothing further beyond". This message served as a warning to ancient sailors and navigators to GO NO FURTHER. Today, memories of the Pillars of Hercules are everywhere, especially in Spanish heraldry. Crowned Pillars of Hercules, as well as the Latin phrase that accompanies them, are the supports for the coat of arms of the Kingdom of Spain. The Latin phrase has been altered to "plus ultra" for Spanish heraldry though. This phrase means "more beyond", alluding to the vast Spanish Empire on the other side of the Atlantic Ocean. 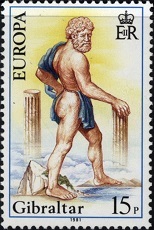 Variants of the pillars, some even depicting Hercules, also adorn the coats of arms of many of the states and cities of Spain. After the fall of the Roman Empire, the region that includes Gibraltar became part of the Christianized Visigothic Kingdom of Hispania. In the 7th Century, the Umayyad Caliphate began expanding outside of their original homeland of Arabia, conquering large parts of North Africa, the Middle East, and Western Asia. In their wake, they converted the conquered peoples to their religion of Islam. The Berbers of North Africa, called the Moors by Christian Europeans, thereby became Muslims. The Strait of Gibraltar became the boundary between Muslim North Africa and Christian Hispania, thus gaining a new strategic significance. During the 8th Century, Visigothic Hispania was embroiled in civil wars. This situation gave the Moors a prime opportunity for an invasion of Hispania. In 711, a Berber army, under the command of Tariq ibn Zyiad crossed the strait from North Africa, landing near the Rock of Gibraltar. 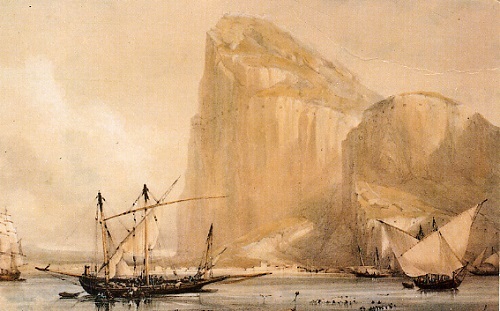 Mons Calpe was renamed to Jebel Tariq, or Tariq's Mountain, a name which, after centuries of mispronunciation, has evolved into the word "Gibraltar". Gibraltar, as well as much of the Iberian Peninsula, would continue under Moorish rule for the next 750 years! Shortly after the invasion, Tariq ibn Zyiad began the construction of a castle on the side of the Rock of Gibraltar extending down to the sea. During the ensuing centuries, the fortifications around the Rock of Gibraltar were repeatedly besieged by the armies of the Kingdoms of Castile and Aragon, but the Moorish defenders survived. During the early 14th Century, the castle was re-built and re-fortified by its Moorish inhabitants. Today, the most conspicuous parts of the fortress that still remain are the Tower of Homage, terraces and battlements below the tower, and the massive Gate House, with its cupola roof, as shown in the illustrations above. Following the fall of Grenada to the combined forces of Queen Isabella I of Castile and King Ferdinand II of Aragon on January 2, 1492, the Moorish Emirate in the Iberian Peninsula came to an end. The two victorious monarchs later married. Though their marriage united the two kingdoms, leading to the emergence of modern Spain, they ruled independently, and their kingdoms retained their own regional laws and governments for the next few centuries. Under the rule of the Spanish crown, the town of Gibraltar fell into severe decline. The end of Muslim rule in Spain and the Christian capture of the southern ports considerably decreased the peninsula's strategic value. Despite continuing threats in the Strait of Gibraltar, especially those of the Barbary Pirates, the fortifications of Gibraltar were neglected and eventually fell into disrepair. The status of Gibraltar was finally settled as a result of the War of the Spanish Succession (1701-1714). During the war, the port was occupied by British and Dutch naval forces, and it was administered as a "free port". 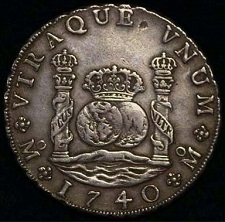 The war was finally settled through treaties and territorial concessions ratified by the Treaty of Utrecht in July 1713. Article X of the treaty awarded the town, fortifications, and port of Gibraltar to Great Britain "for ever, without any exception or impediment whatsoever". Article X also stipulated that if Great Britain was ever to dispose of Gibraltar, it would first have to offer the territory to Spain. Of course, this has never happened. Spanish naval forces tried on a couple occasions to re-take Gibraltar during the late 18th Century, but by the end of the century, they had been defeated, and the British Crown Colony of Gibraltar was firmly established. Back home, the British public developed an emotional attachment to Gibraltar. Its perceived impregnability gave rise to the expression, still in use today, of something being as "strong as the Rock of Gibraltar". During the Napoleonic Wars (1803-1815), a naval battle was fought very near Gibraltar, which was then an important base of the British Royal Navy. The battle was fought on October 21, 1805 near the Cape of Trafalgar, just South of Cadiz, Spain. The Battle of Trafalgar resulted in one of the greatest naval battles in history, the greatest British naval hero of all time, and a motto that resonates with Britons around the World to this day. Twenty-seven British ships, commanded by Admiral Lord Nelson aboard the HMS Victory, defeated thirty-three French and Spanish ships, commanded by French Admiral Pierre-Charles Villeneuve. The Franco-Spanish fleet lost twenty-two ships. Some of the British ships, including the HMS Victory, were heavily damaged, but none of them were lost. The British victory confirmed the naval supremacy that Britain had established during the 18th Century. This was achieved, in part, through Nelson's departure from normal naval battle tactics of the time. Normal naval tactics involved engaging an enemy fleet in a single line of battle, parallel to the enemy, to facilitate disengagement and to maximize the target areas. Nelson divided his smaller force into two columns, directed perpendicularly against the larger enemy fleet, and the results were decisive. About half way through the engagement, Nelson ordered that the following flag-signal be sent to the fleet from the HMS Victory: "England expects that every man will do his duty". This famous line has been the patriotic motto for the British people ever since then. Admiral Lord Nelson was critically injured during the battle. 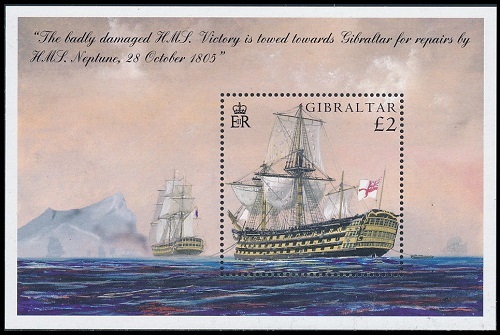 His ship, the HMS Victory, was towed into Gibraltar for repairs. Many of the British sailors that died in the battle are buried in a memorial cemetery in Gibraltar. The HMS Victory later returned to Britain, along with the body of Admiral Lord Nelson. Admiral Nelson was given a state funeral, with a procession of 32 Admirals, over 100 Captains, and 10,000 soldiers. After the service in St. Paul's Cathedral, he was interred there in a sarcophagus originally carved for Cardinal Wolsey. It has now been over 300 years since the Treaty of Utrecht awarded Gibraltar to Great Britain. 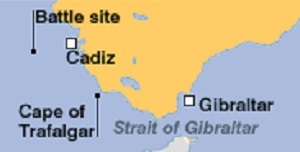 But the sovereignty of Gibraltar is still a major point of contention in Anglo-Spanish relations. In the 1950's, Francisco Franco renewed Spain's claim of sovereignty over Gibraltar, and his government restricted movement between Gibraltar and Spain. 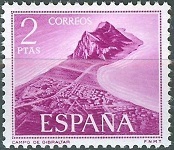 In 1967, a referendum was held in Gibraltar to determine if the citizens wanted the colony returned to Spanish sovereignty. The citizens of Gibraltar voted overwhelmingly (99.1%) to remain under British sovereignty. 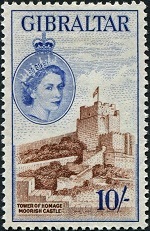 This referendum led to the passing of the Gibraltar Constitution Order of 1969, which reaffirms the referendum vote of 1967. 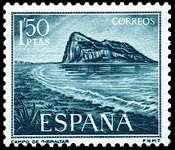 This constitution order angered the Spanish government, who issued the set of stamps, shown above, picturing the Rock of Gibraltar. The Spanish government then completely closed the border with Gibraltar and severed all communication links with the British colony. The border crossing with Spain was partially reopened in 1982, and it was fully reopened in 1985, as a condition for Spain's admission to the European Community. Another referendum was held in Gibraltar in 2002, and once again, the citizens voted overwhelmingly to remain under British sovereignty.